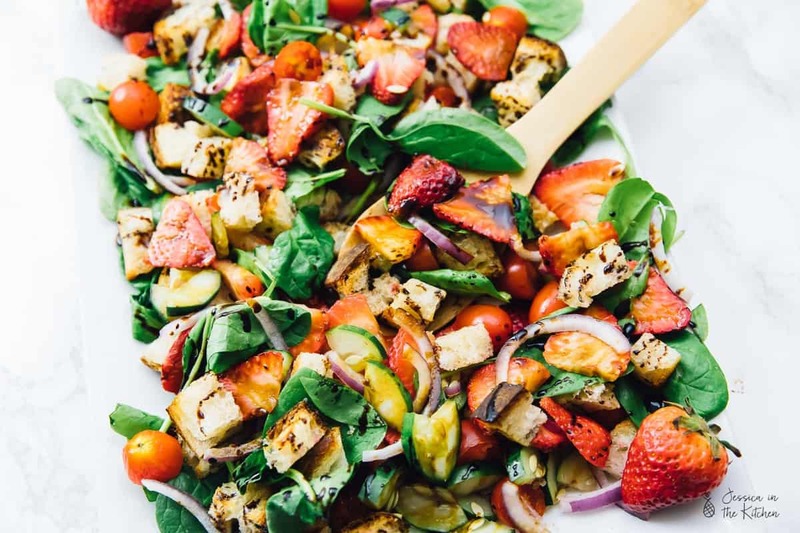 This Strawberry Panzanella Salad is made with only 6 main ingredients and is SO delicious! It’s perfect for any get togethers, parties or even a delicious lunch or dinner! This post is sponsored by Walmart! All opinions and text are 100% mine. Thanks for supporting the brands that support Jessica in the Kitchen! Happy almost summer! The sun is warmer, the sky is bluer, and it’s outdoors weather. Gav and I have some fun memories, even before we were married, of co-hosting summer parties either at my parents house or now at our apartment. They’ve always been small, but filled with lots of love and of course, amazing food, which equals to love. 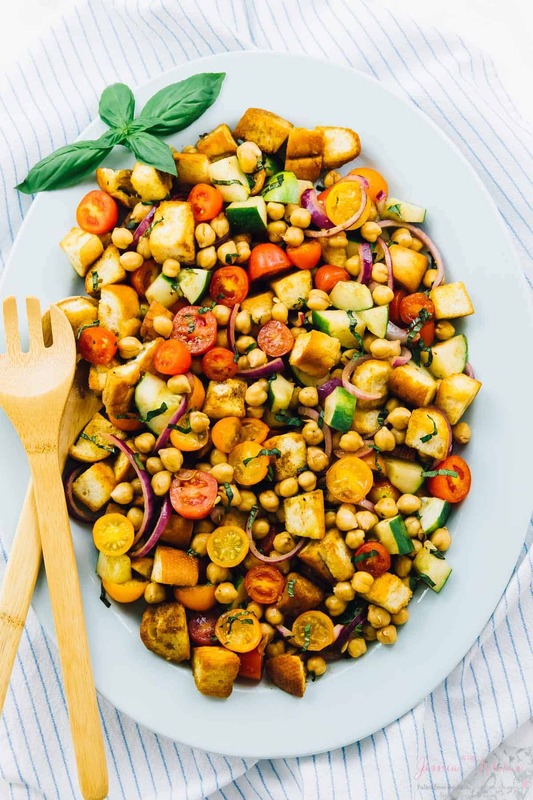 As we get constantly busier each summer, we’ve been implementing a strategy of making easy and delicious dishes, that taste like hours of labour went into them. 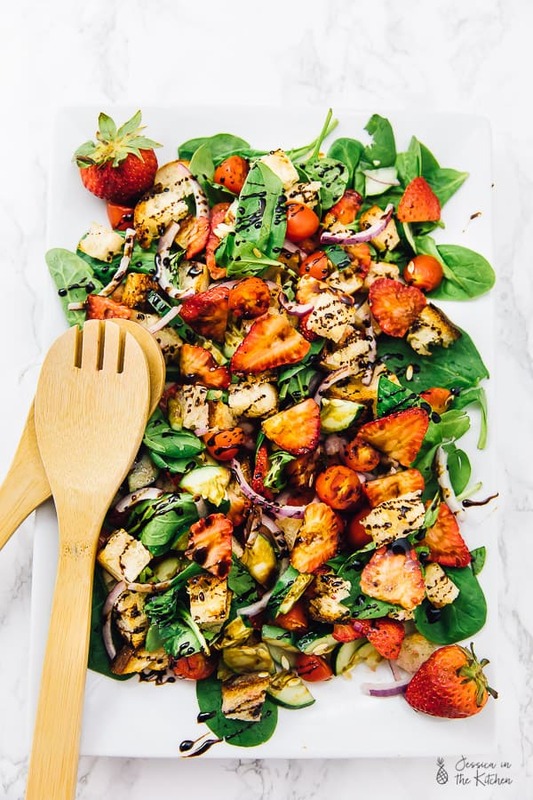 Whether that’s a 10 minute summer drink, or a 20 minute Strawberry Panzanella Salad, the goal is always to please our guests, which keeping things nice and simple for us. Win win for everyone! I just noticed a trend I’ve been unintentionally doing. 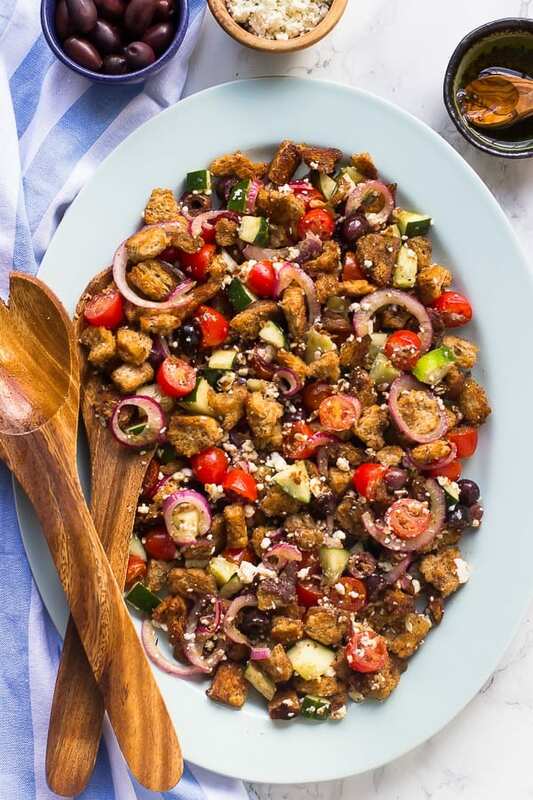 I’ve made a panzanella salad aka a Tuscan Tomato & Bread Salad every summer for the last two years. 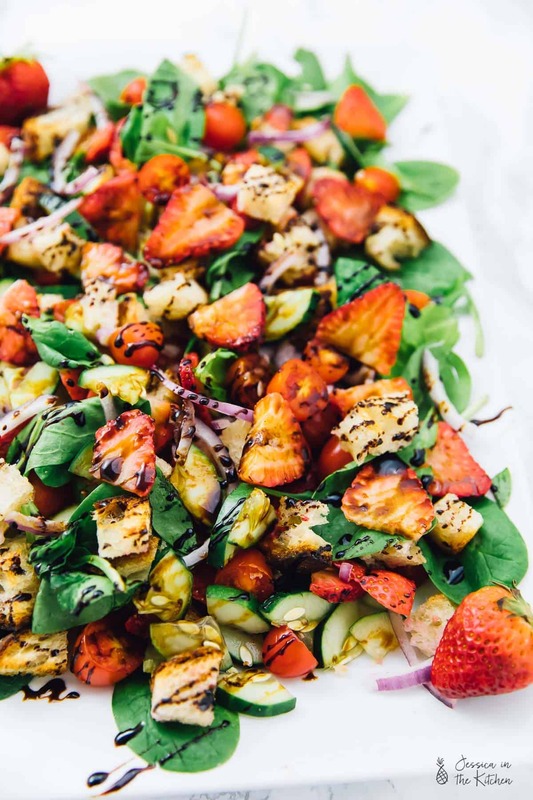 First it was a Greek Panzanella Salad, then a Chickpea Panzanella Salad, and now this gorgeous and absolutely enthralling Strawberry Panzanella Salad with a Balsamic Drizzle. They’re all delicious in their own ways, and I love the fruity element to this one! A very fun fact about this entire post? Everything I used – the ingredients, the salad spoons, the platter, even the measuring cups – were ALL bought at Walmart! 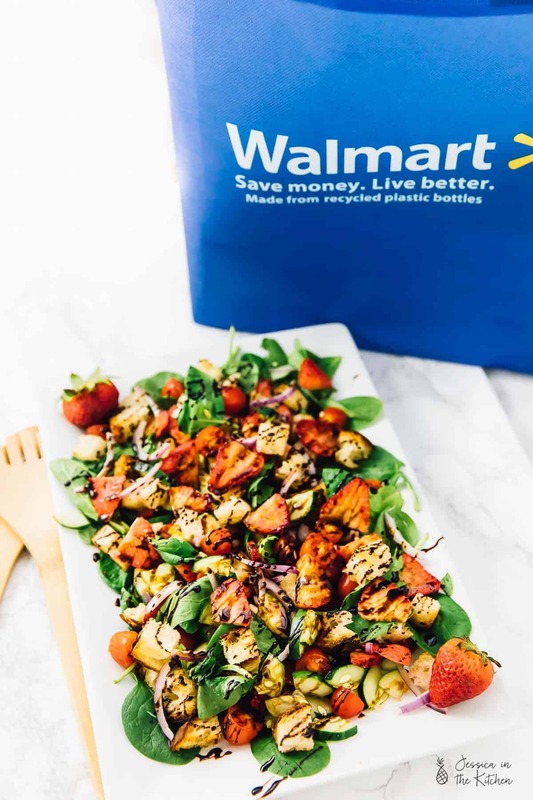 I’m so excited to be collaborating with Walmart on this post to bring you this bright and fresh Strawberry Panzanella Salad since I was so excited to get everything there! This will definitely be my one stop shop for summer. Let’s talk about how Walmart has been going hard on the locally-grown fresh produce game. Most people might not be aware of Walmart’s commitment to selling locally grown produce, but they are using their scale to support local communities by working with farmers across the U.S. to provide an abundance of locally grown produce to customers. The produce section is huge across their stores. I’m talking endless options, and since I was there for a few hours (yup, I’m that girl wandering the aisles of the supermarket for hours in her happy place), I got to actually see the restocking process! Not only does Walmart restock their produce at least once a day, they now have an organic produce section stocked with delicious veggies! 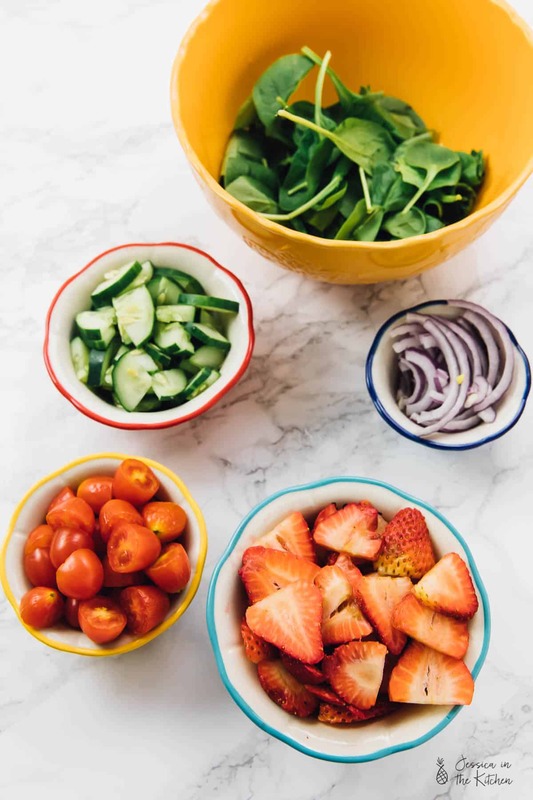 Even though I love slowly getting produce in store when I have the time, it’s amazing to know if you’re short on time, you could also use their Online Grocery Pickup for convenience! I was really impressed by the selection there and in the entire store and loved that I could get everything I needed in just one stop. I checked out a few of their collections, like the Pioneer Woman collection, which I loved. Ree’s blog was one of the first that I followed, so I grabbed some mixing bowls, measuring cups, and even one of her knife’s from her Pioneer Woman collection. In fact, Walmart’s Brand Promise Mission is “to provide the utmost quality fresh locally grown produce at a price that saves customers money.” They are definitely fulfilling this. I found the prices definitely affordable, the and loved that everything I needed for this great, delicious and vegan salad was all there. The strawberries, as you can see, where bright and gorgeous, along all the other veggies I used for this post. I followed Walmart’s Quick Tips for Selecting the Best Fruit which came in pretty handy, so the ones I ended up with were nice and sweet. Like, I literally had to stop myself from eating them before they went into the salad. I really wanted this since the strawberry flavour stands out, yet beautifully complements everything else at the same time, especially that balsamic glaze. Putting together this salad was very easy. You toast the bread, chop the ingredients, and toss them together. Ridiculously easy, right? For the balsamic glaze, you could either buy a pre-made balsamic glaze in Walmart, or make your own like I did from Walmart ingredients. I kind of prefer the second option because well, I love everything from scratch and love that you can control the sweetness, the viscosity and any other factors involved in the glaze since you’re about to pour it all over the salad. The balsamic glaze adds a very nice sweet umami flavour to the whole dish that has me wanting to eat this all over again for lunch today. The textural and flavour elements of sweet, crunchy, brine-y and fruity make this a crowd pleaser since your guests are bound to find something in this salad that they love. Other ideas? 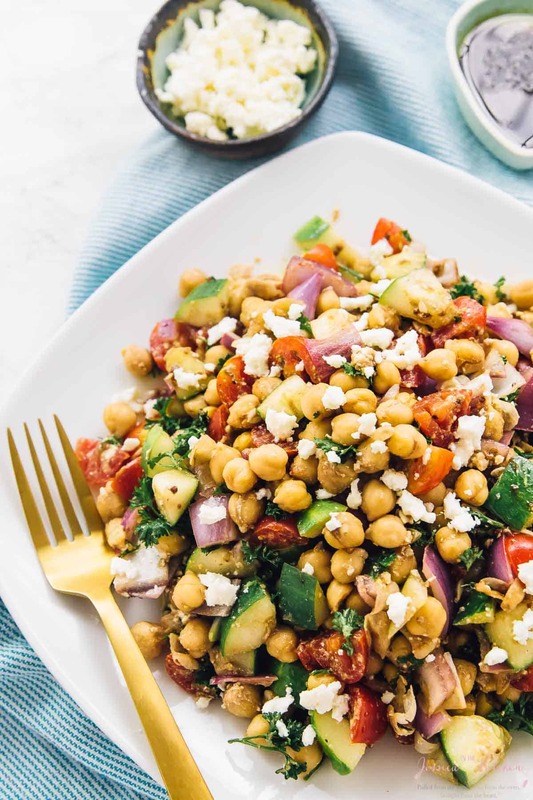 You can just make this for a bright summer salad for a weeknight dinner for one or two with all that fresh produce that you picked up! 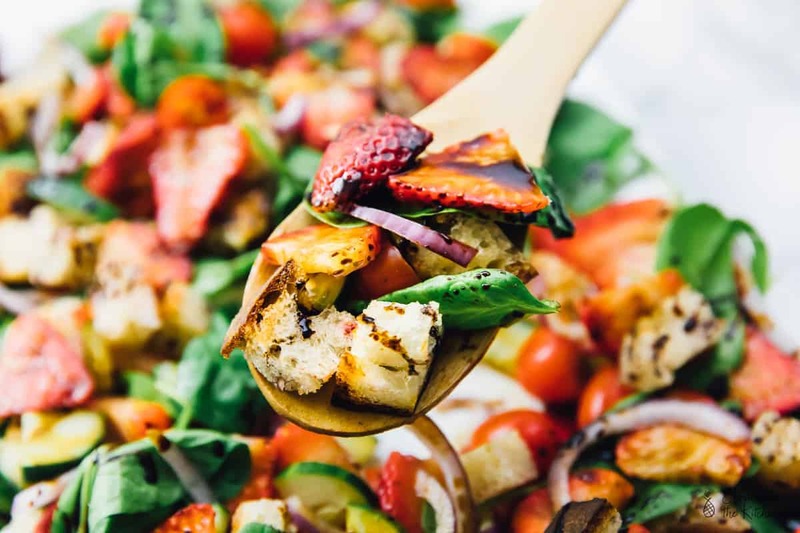 The final point before I give you the recipe for this Strawberry Panzanella Salad 🥗 – you definitely HAVE to toast the bread. You should purchase a fresh bread, then let about a day or two pass so it gets a bit crusty and stale. That’s the perfect texture for this since it’ll crisp up beautifully in the oven and remain that way even after the balsamic drizzle is added to the salad. Enjoy, friends! This post is sponsored by Walmart! All opinions are 100% mine. Thanks for supporting the brands that support Jessica in the Kitchen! Preheat oven to 450 ° F/ 230 ° C.
Add the bread cubes to a silicone mat on a baking sheet or a baking sheet prepared with parchment paper or foil. Drizzle with oil, then rub into the cubes to combine. Bake for 5 minutes. Remove from oven and set aside to cool. 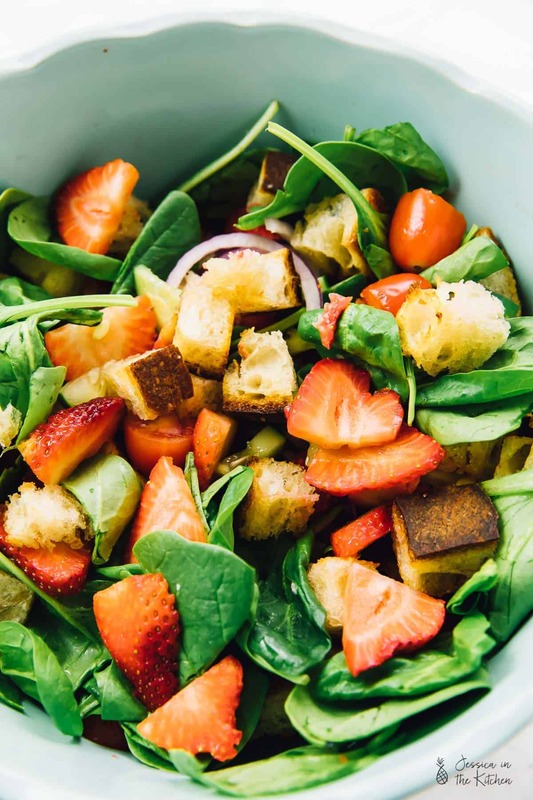 In a large mixing bowl, add the spinach, toasted bread cubes, strawberry slices, the cherry tomatoes, red onions and cucumber cubes. Toss until combined. Once glaze has thickened, remove from heat. Allow to cool slightly - it will thicken while it cools too. The glaze can be stored in the refrigerator once it has cooled down for at least a month. Plate the salad and drizzle the balsamic glaze over it. Only drizzle glaze right before you're about to serve it. So happy that you enjoyed the salad! !